Don’t judge a book by its cover but DO judge a restaurant by its crowd! If that’s the case, then Cafesserie is truly the real deal. 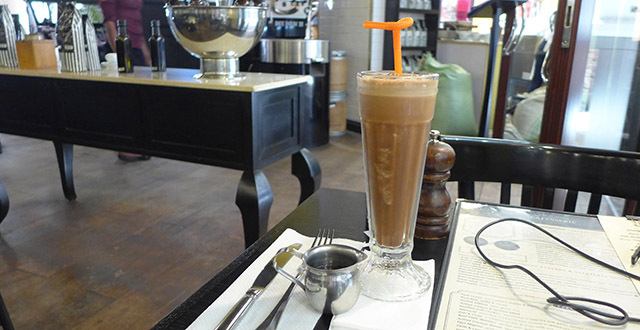 Cafesserie recently opened in February at the lovely new Acacia Mall and, at any given moment, this new café is absolutely packed full of people enjoying this incredible new spot! Call it the “new restaurant hype” but I really don’t think that’s the case. With a friendly staff, fresh quality food, and a prime location, it certainly sounds like a recipe for success! As you can tell, I’m a huge fan of this place. They’ve done a wonderful job of creating a classy atmosphere that suits a breakfast, lunch, happy hour, or dinner crowd. You can tell that the owners and management pay a lot of attention to detail and hold a high standard of quality. Everything seems to run smoothly and all of the patrons seem to be enjoying themselves. You can choose between sitting outside on their patio or select a table inside to take advantage of the air conditioning. 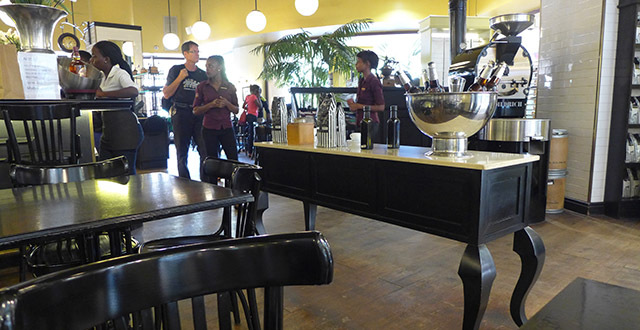 Cafesserie has a large, well-trained staff to tend to their many tables which seem to always be full! A smiley hostess helps you find the perfect table and one of their servers will take care of you from there. I appreciate how the servers always repeat your order before they rush off. It really shows their commitment to getting your order right the first time. Breakfast is served until 11:30 a.m. and includes several egg dishes, such as Eggs Benedict, traditional English breakfast, Belgian Waffles, and Pancakes. Items on this menu range from 17,000 – 21,000 UGX. Not too hungry? 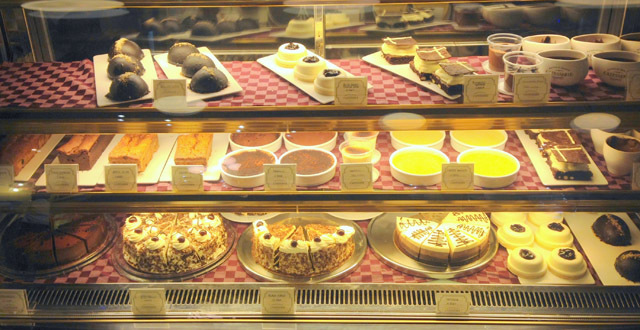 Order an item from their delicious patisserie menu like a danish, croissant, or homemade donut. 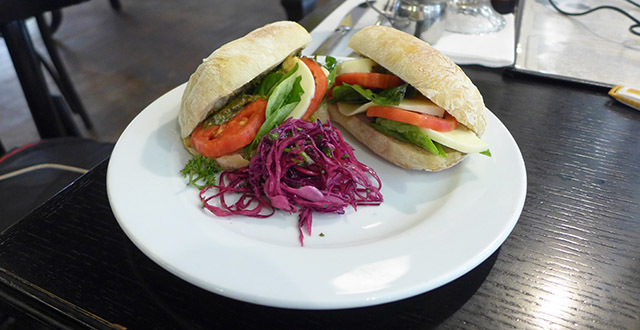 The rest of Cafesserie’s menu is served throughout lunch and dinner. Sandwiches, salads, and burgers are great options for lunch while the pizza, pasta, and items from their specials menu make more substantial dinner options. I’ve ordered from their sandwich menu a few times and the Caprese and Hot Grill Chicken are both good. Note that their sandwiches only come with a small side of coleslaw, so you’ll need to order a side separately. The sandwiches range from 14,000 – 19,000 UGX and they come to the table quickly which makes for a great option if you’re on a short lunch break. 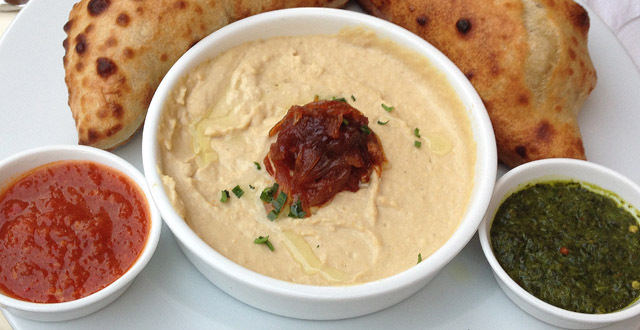 For a starter, I definitely recommend their hummus plate- it just may be the best in town! The pizzas are fabulous and cost in the 20,000 – 26,000 UGX range. They have a special pizza oven and, since they’re also a bakery, the crust is delicious! Their specials menu offers a variety of dishes like Schnitzel, roasted chicken, kebabs, grilled tilapia, fish & chips, and filet mignon. You can expect dishes on this menu to be in the 26,000 – 33,000 UGX range. Everything is high quality and cooked with the freshest of ingredients. Food aside, let me tell you about their amazing coffee. 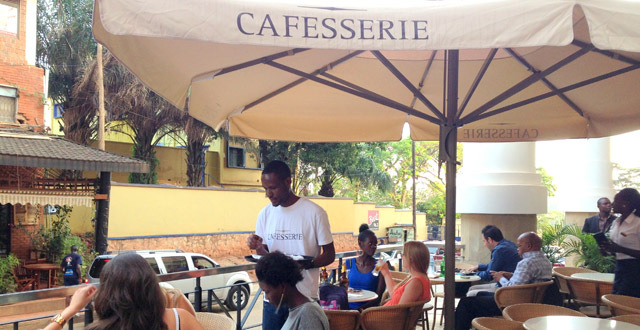 Cafesserie proudly serves Italian coffee and the owners imported espresso machines to help bring the unique espresso bar vibe to Kampala! If you have any room left after your meal, definitely try a scoop of their gelato. It’s pretty much heaven. French bakery. Italian espresso bar. Chic café. Cafesserie is doing a lot of different things and doing them all well. If you haven’t already had the absolute pleasure of dining here, make it your next stop! Hey, I’m Lauren. I’m what you’d call an “expat by marriage.” When my husband and I stepped off the plane in Entebbe in June 2012, I had no idea what I was in for: the breezy traffic on the open road, enjoyable boda rides through the heart of town, or the gentle, lingering smell of exhaust blowing in my face. I continue to be amazed by the strong community in Kampala, the arts, the delicious food, and the fun hangs around this town. I’m committed to sharing the very best of Kampala with you through this website. Contact me anytime with your ideas, feedback, or jokes at lauren@livinginkampala.com.